A Homemade Easter Cake easily becomes the centerpiece on the Easter Holiday table. Decorated with baked chocolate bunnies and various colors of jelly beans, this Easter Cake is eye-catching. This cake is a delicious dessert for both the children and adults. Mix the flour and baking powder and sift into a bowl. Add sugar and vanilla flavor and mix. Spread the cold but soft butter on top of the mixture and knead with your hands until the shortcrust is smooth. 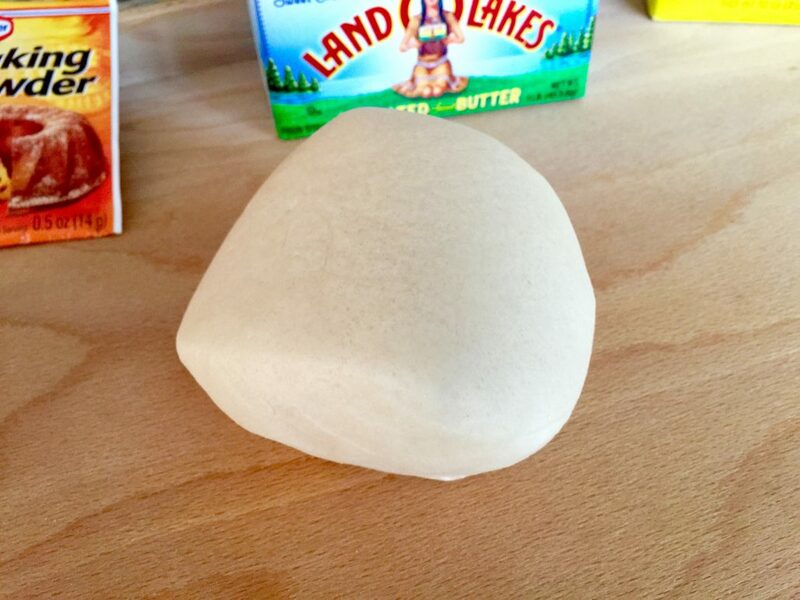 Spread some flour on your work space and roll out the dough with a rolling pin about 3mm (0.11 inches). Cut out 12 bunnies, six bunnies shown from the right side and six bunnies shown from the left side. (Just turn the cookie cutter). 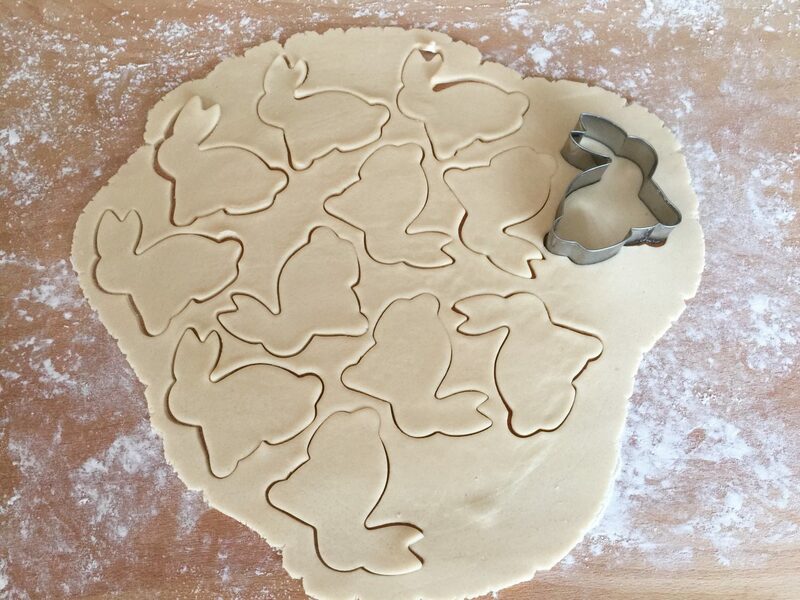 Place the bunnies on a baking sheet (17 x 11 inches). Preheat the oven to 175°C-200°C (350°F-390°F) and bake on the middle rack for about 8-10 minutes. 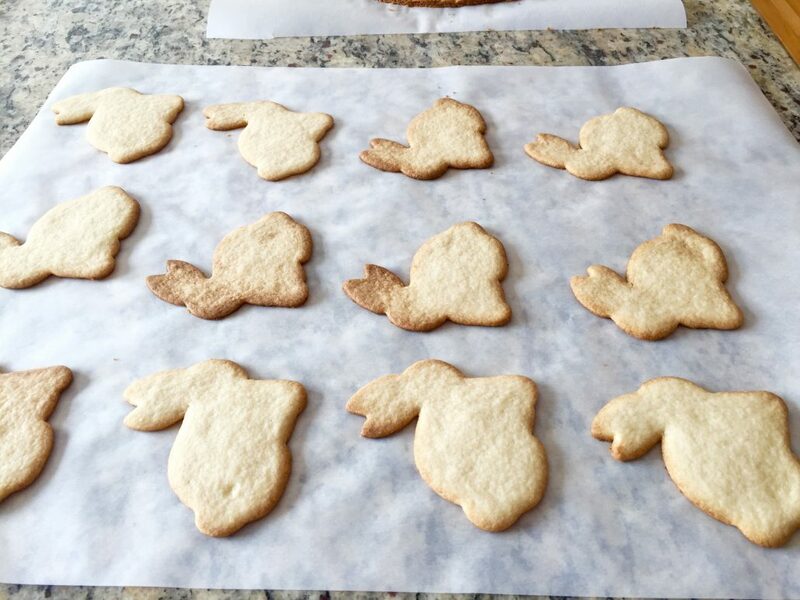 Take the bunnies out of the oven and place them on a cooling rack. 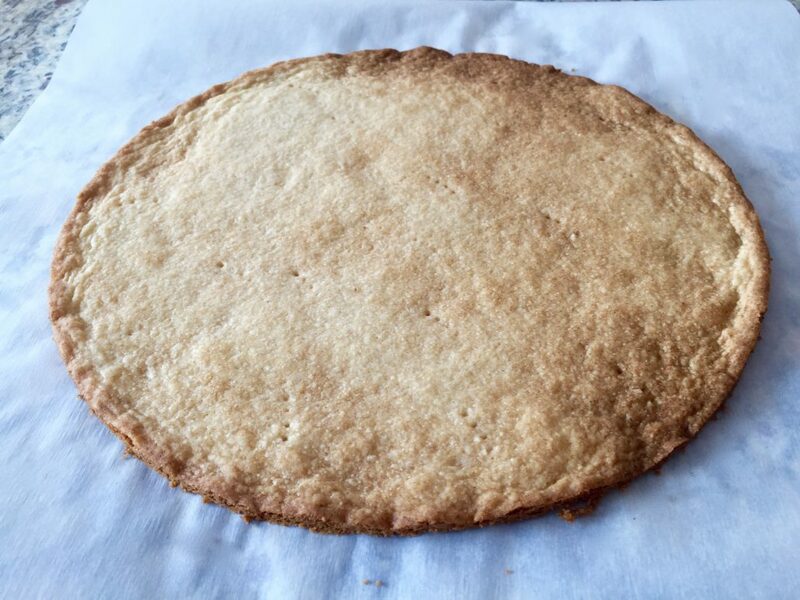 Spread the rest of the shortcrust pastry in a springform pan (10″ or 11″ in diameter). 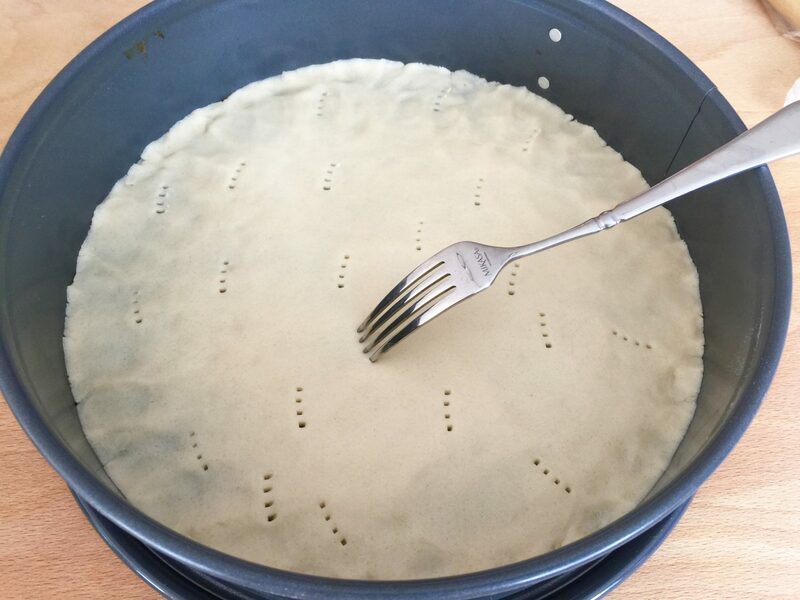 Make some holes with a fork into the dough. Bake the shortcrust on the middle rack in a preheated oven at 175°C-200°C (350°F-390°F) for about 15 minutes. Take the shortcrust out of the oven and open the ring of the springform immediately. Slide the shortcrust from the bottom of the baking pan onto a cooling rack and let it cool down. Separate the egg yolks from the egg whites using an egg separator. Mix the egg yolks with hot water until frothy. Add the sugar, and your choice of vanilla flavoring of choice and mix until creamy. Beat the egg whites with a handheld mixer until stiff and place the beaten egg whites on top of the egg yolk mixture. Combine the flour, starch, baking powder, and cacao and sift over the eggs. 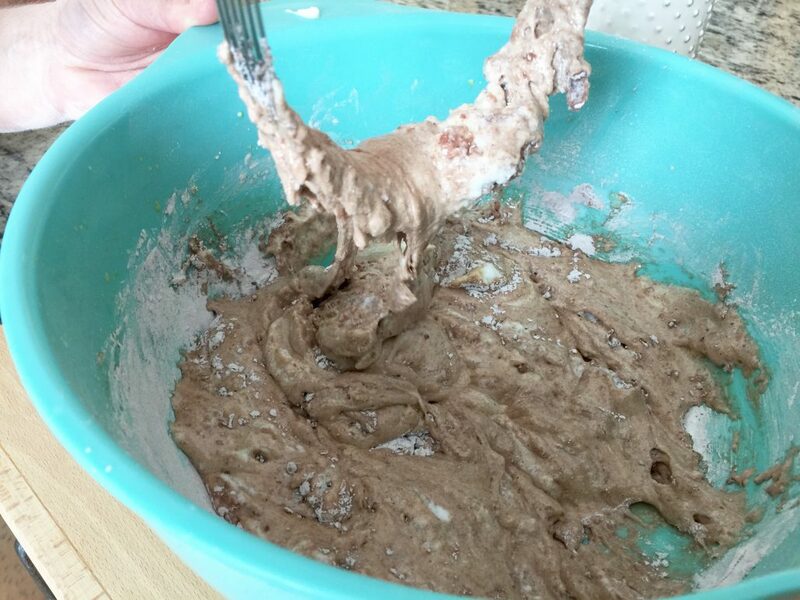 Using a pastry blender or a large whisk, slowly fold the beaten egg whites and the flour mixture into the batter. Melt the butter and let it cool down. 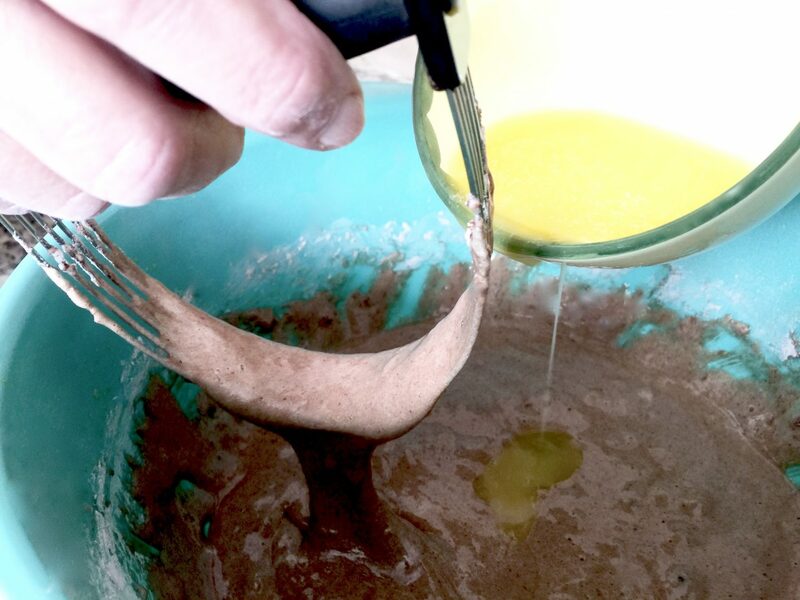 Add the butter slowly to the batter while mixing with a pastry blender or large whisk. 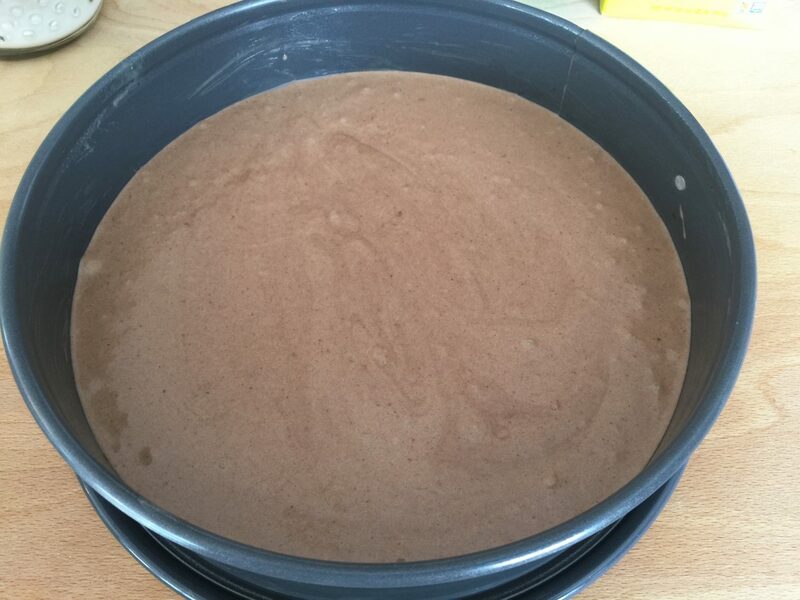 Fill the batter into a buttered springform pan the same size as you used for the shortcrust pastry (10″ or 11″ in diameter). Bake the sponge cake in a preheated oven at 175°C-200°C (350°F-390°F) on the middle rack for about 20 – 25 minutes. Take the sponge cake out of the oven and let it cool down. The Easter Cake is built with the shortcrust on the bottom, the sponge cake in the center and on top, and the bunnies as decoration. Cut the sponge cake in half horizontally. 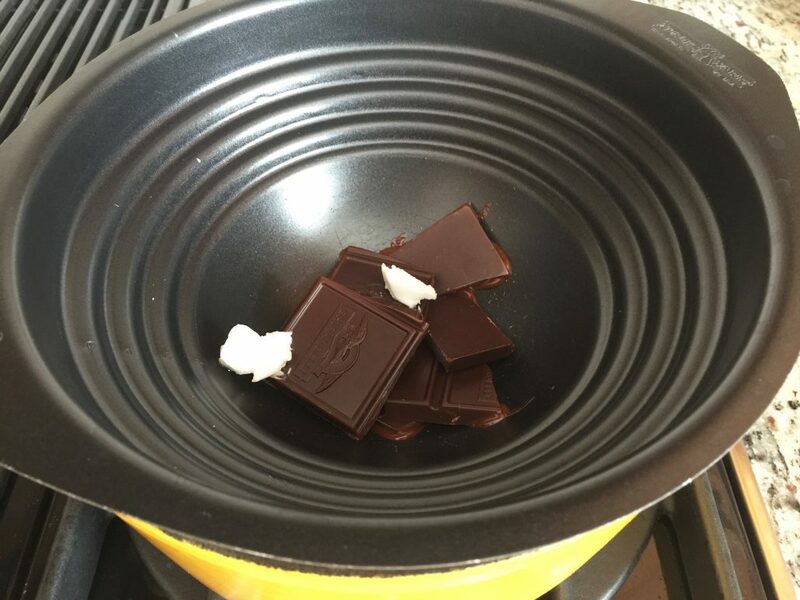 Melt the chocolate together with a knife tip of shortening in a bain-marie and brush the bunnies with the melted chocolate. Melt the white chocolate with a teaspoon of shortening in a bain-marie and brush the top of the sponge cake. Sprinkle the green candy shred or green sugar sprinkles on top of the white chocolate while the chocolate is still liquid. Let the chocolate dry. Grind the pistachios finely in a coffee grinder. Place the mandarin oranges into a sieve to drain, keep the juice in a bowl. Pass the cherry preservative through a sieve. 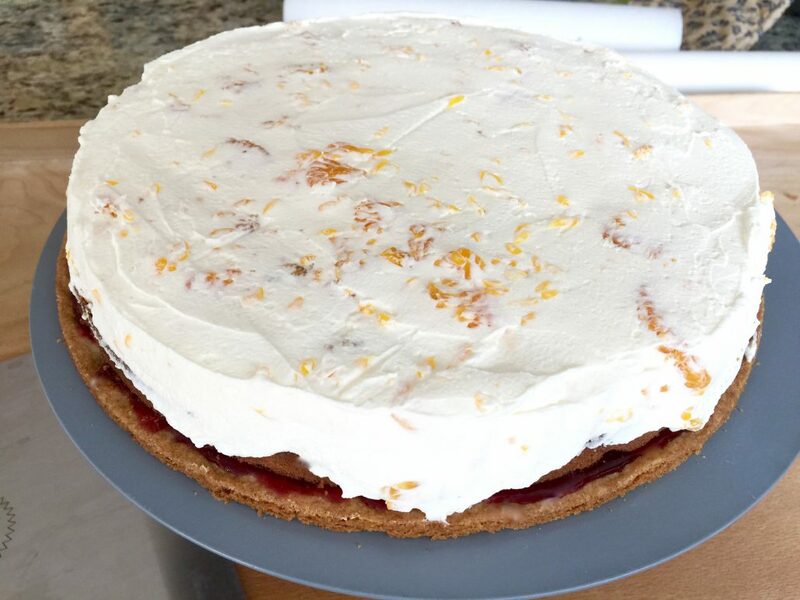 To finish the cake place the shortcrust on a cake turntable stand. Spread the cherry jam onto the shortcrust. 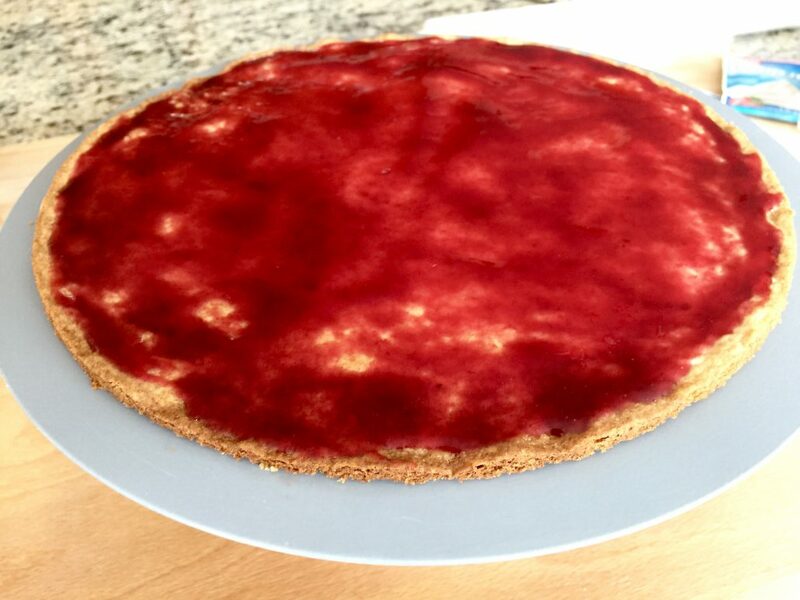 Place the bottom half of the sponge cake on top of the cherry jam covered shortcrust. Add vanilla sugar, and “Whip it” to the whipping cream and beat the cream until stiff. Add five tablespoons of the juice from the mandarin oranges to the cream, one tablespoon at a time and beat. Place 300 g — 10.58 oz of the whipped cream and place it in a separate bowl aside. 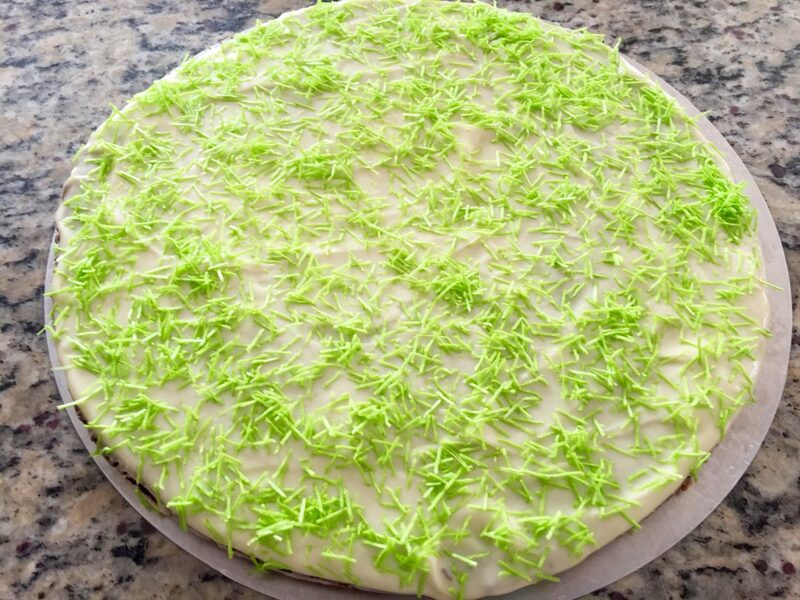 It is for later use to decorate the sides and the top of the cake. Stir the drained mandarin oranges together with the rest of the whipped cream and spread this filling equally on the sponge cake (sitting on top of the cherry jam). 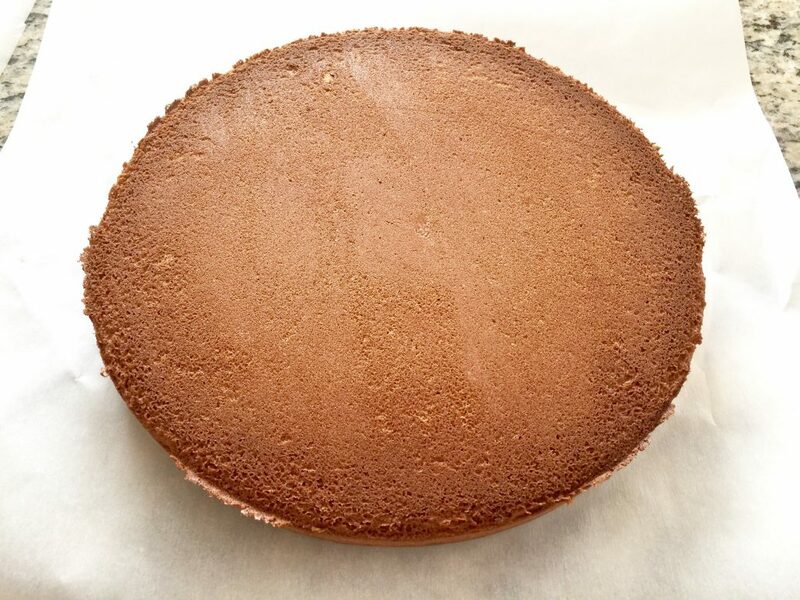 Place the chocolate decorated top of the sponge cake onto the whipped cream filling. Fill about 6-8 tablespoons of the whipped cream (you set aside) into a decoration bag to attach the bunnies and to decorate the top. Use the rest of the whipped cream to spread it on the sides. 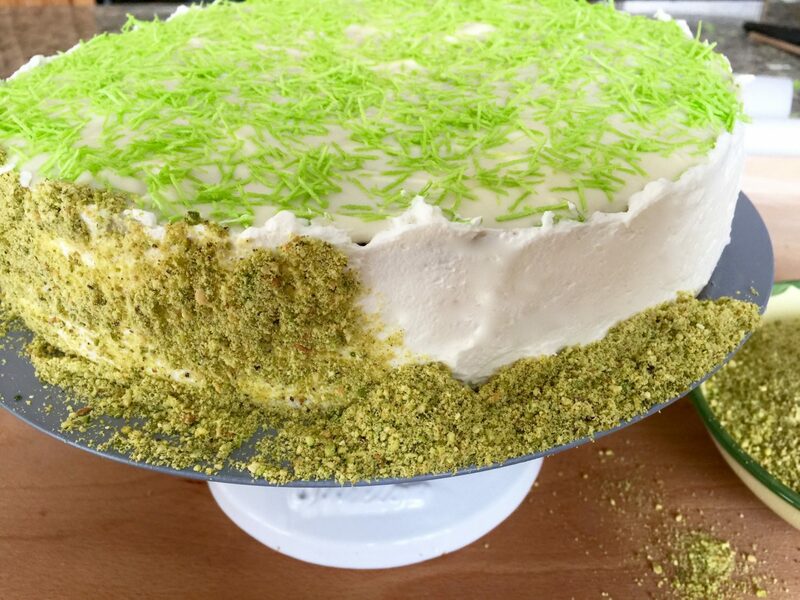 Place the ground pistachios or chocolate sprinkles in a piled line around the cake close to the edge of the cake. Use a straight spatula to lift the pistachios/chocolate sprinkles carefully, so they stick to the sides on the whipped cream (start from the bottom and work towards the top). Place the cake on a serving plate before finishing the decoration on top. Use the whipped cream of the decoration bag to attach two bunnies on their heads (left and right side). Place the attached bunnies on a line of whipped cream in the center of the cake as shown in the picture below. Finish the decoration of the cake to your personal liking.